At the end of June 2018, the Free Beacon reported Karen Waters the daughter of Rep. Maxine Waters’ has been paid over $750K. from her mother’s campaign since 2004. Now a campaign watchdog has filed a complaint with the FEC about the possible scam the younger Waters is working on for her mother’s campaign. NLPC filed a Complaint with the Federal Election Commission alleging that Rep. Maxine Waters (D-CA) violated federal election law in a transaction related to her so-called slate mailer during her last re-election campaign. The transaction was a payment to Waters’ campaign fund from the Democratic State Central Committee of California (DSCCC) in the amount of $35,000 for the inclusion of then-Senate candidate, and now Senator Kamala Harris, on Waters’ slate mailer. Whereas candidates like Harris may legally pay Waters’ campaign for the proportional costs of their inclusion on her slate mailer, it is not legal for such payment to be made by a third party like the DSCCC. Waters’ slate mailers have been a matter of controversy for years. They resemble a sample ballot distributed by political parties before and during elections but contain Waters’ personal endorsements. She pioneered a new way to use slate mailers by seeking an Advisory Opinion from the Federal Election Commission in 2004 that allows her to use her federal campaign to also function as a State of California slate mailer committee while still maintaining eligibility as a principal federal campaign committee. The main beneficiary of the slate mailers appears to be companies controlled by Waters’ daughter Karen Waters, which have received hundreds of thousands of dollars to produce the mailers. Critics have charged that Waters’ slate mailers are a way to evade contribution limits. The Complaint alleges that the DSCCC payment was not legal under the Advisory Opinion. The Complaint further alleges that the DSCCC payment was made for purposes of influencing a federal election, making it a coordinated communication, well in excess of contribution limits. In addition to a request for an investigation of these apparent violations, NLPC asks for an audit of Waters’ campaign committee. Sadly, even if Waters is found to have violated campaign laws by the FEC, it is doubtful it will affect her vote totals. She is a Teflon hater. 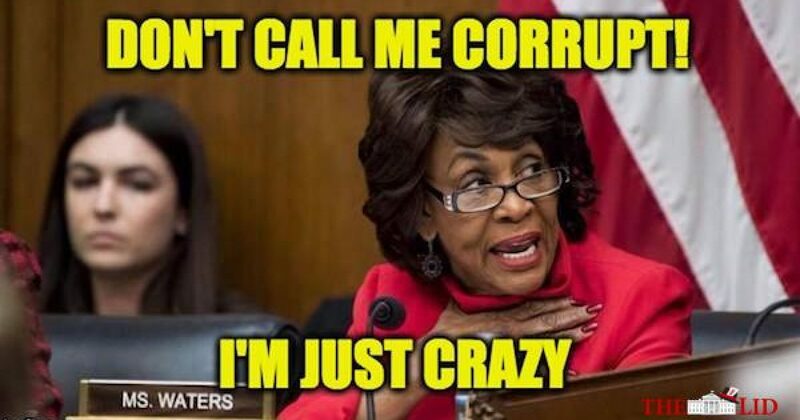 For example, in 2010, Waters was brought up on three separate charges by her colleagues in the House, even after Rep. Barney Frank (D-MA) warned her against getting involved in advocating for a bank in which she had a financial interest. She avoided those charges by throwing her grandson under the bus. The left-wing Citizens for Responsibility and Ethics in Washington included Maxine Waters in their 2009’s Most Corrupt People in Congress thanks to the One United scandal. That was her third time earning that dubious recognition, . Waters was included in CREW’s 2005 report for using “her position financially benefit her daughter, husband, and son. Rep. Waters’ family has earned a total of more than $1 million in the last eight years through business dealings with companies and issue organizations Rep. Waters has assisted.” And in 2006 for the same reason (but gives new examples) In 2011 Waters won their big Kahuna. She wasn’t named one of the most corrupt people in Congress, but the absolute most corrupt person in Congress. Despite the corruption, Maxine Waters has never received less than 70% of the vote in her southern California district.